Richard Moore in action against former club Halifax during the 2019 Yorkshire Cup. A serious head injury has forced Hunslet forward Richard Moore into retirement. It brings an end to a stellar career for the 37-year-old, who made over 350 first-team appearances for numerous Super League and Championship clubs. He re-joined Hunslet for a third time ahead of the 2019 campaign, following successful stints in 2013 and 2014, when he won the Championship 1 Grand Final at Headingley. However, the former Halifax and Featherstone Rovers forward sustained a serious head injury in Hunslet's opening Betfred League 1 game against Doncaster at the end of February. After further tests and consultations, Moore was told he would need an operation and that he would be unable to continue playing rugby league. "I’m deeply sorry that I couldn’t fulfill my contract with Hunslet," said Moore. Moore (left) celebrates winning the Championship 1 Grand Final with Hunslet in 2014. "I would just like to personally thank the club for all of their help following my injury, and thank the fans for all of their support whenever I have been there. "Unfortunately my career has come to an end. "I’ve loved my time at Hunslet, and Hunslet will always be a club close to my heart." Hunslet Director of Rugby Darren Williams added: “To lose Richie so early into his return to the club is a huge blow. Moore suffered a career-ending head injury against Doncaster. "Not only to what we wanted to achieve on the field this year but because he was instrumental on the commercial front and in helping to increase season ticket sales. "He was excited about returning to the club, having a clear goal to help us achieve promotion and establish ourselves in the Championship. The forward started his career in the Leeds Rhinos academy before moving to Bradford Bulls in 2001. He spent four years with the Bulls while also turning out for Keighley Cougars and London Broncos on loan. Moore moved to Leigh Centurions in 2005 and scored five tries in just 10 appearances in his second season with the club. 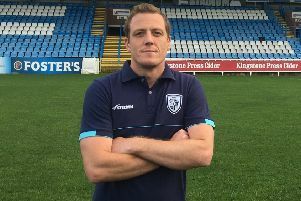 The 37-year-old returned to Yorkshire in 2007, where he made over a century of appearances for Wakefield Trinity during a four-year stint at Belle Vue. He was diagnosed with Crohn's disease at the beginning of 2009 but refused to let that stop him continuing his rugby career. He was released by Trinity in 2010, paving the way for a move to newly-promoted Crusaders. Stints with Leeds Rhinos - where he played 32 times - and Wakefield followed before the forward dropped down to the Championship. The 37-year-old joined Halifax in 2015, where he made 54 appearances during a two-year spell. He then opted for a switch to rivals Featherstone Rovers and soon became a firm fan favourite at the LD Nutrition Stadium. Moore made 45 appearances for the club before leaving for Hunslet at the end of last season. The forward and his family will be guests at Hunslet on March 31 as the Parksiders face Halifax in the Coral Challenge Cup. The club are planning to make a presentation to Moore in recognition of an outstanding career.